Candace Fances Frost Claybourn was born on 29 August 1856 in Texico, Illinois. On 4 July 1882 she married Arthur Oscar Botts. [Arthur Botts was born on 28 September 1860.] She penned the following autobiographical sketch in 1936. “I was born August 29th, 1856, in Jefferson County, Illinois, near Mt. Vernon on a stock and grain farm. I was the eleventh of fourteen children and lived there on the farm until I was twelve years old, my mother having died a few years before and my father having remarried. I attended the little country school where I received all my education. After leaving the farm, I lived with my brothers and sisters until I was married on July 4th, 1882. “I was married in a rather interesting fashion. My husband (Arthur Oscar Botts) obtained the marriage license in Jefferson County, and my sister Sally, where I was then staying, lived in Marion County on the highway that divided the two counties. When we realized her house stood across the highway from the county in which the license was obtained, we all left her house and walked across the road into Jefferson County where we stood and were married. We then drove in a big double carriage up to Woodlawn where my brother (James) lived and visited them a few minutes; then drove on to my husband’s home in Centralia. “Because of the severity of the winters, my husband’s parents had decided to move to Florida, and on July 13th of that same year (1882) we started our journey south in a big covered wagon with a span of large percheron horses. We were equipped with rubber blankets, bedding, cooking utensils, etc., and camped out each night, usually near a farm house in order to have water available. I remember too we carried a tiny portable organ as my husband’s family of six were all musical, but down in Kentucky it became too burdensome and consumed too much room so we disposed of it. Each Sunday en route we rested, and once each week we stopped at a farm house to do our accumulated washing. Most of the roads were graded but very few were improved, and after we reached the southern sand country we all had to walk because the horses were becoming worn and the load was heavy and the sand deep. In another letter she told Norah she had expected Florida to be the “land of the flowers” and was disappointed in its wild and unimproved state in 1882. Her brother James spent part of two winters with her the latter part of his life, and Norah visited at their home in the 1920s and urged them to make a trip to see some of their scattered Claybourn relatives. About 1928 they bought a new car and with their daughter Stella made the trip. They visited some of James Claybourn‘s children in Evansville, Indiana, and at Harriette Threlkeld’s home and with other relatives in Southern Illinois, visited her brother John’s family in Albert Lea, Minnesota, some of Sally’s children in Kansas, Norah in Oklahoma, and her brother Cashus and half-sister Belle in Texas. They were afterwards very happy that they made the trip. Her husband Arthur bought her a pearl necklace for her birthday while they were on the trip, and when she opened it, she exclaimed, “Oh, you sweet old papa!” and that became a family saying. During the latter part of Arthur’s life he operated the St. John’s River Ferneries with his son Laurance. They lived in DeLand, Florida. Arthur died on 6 February 1946 and Candace followed two years later on 16 February 1948 at the age of 92. All of Candace’s children except Eulla were born in Emporia, Florida. 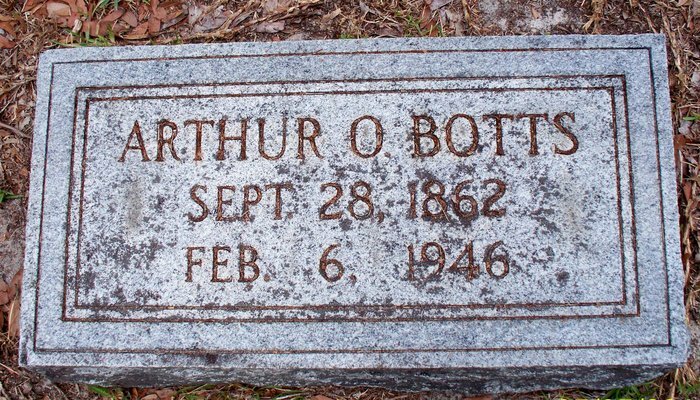 Harry Arthur Botts was born on 29 April 1883. He lived in Fort Myers, Florida, and then later in Pensacola, Florida. Harry was allegedly a crack shot with a rifle at age eight, and would row at that age many miles to meet his father who had been alligator hunting up river. On 16 June 1906 he married Eulla Panthea King (born on 3 September 1883 in Alabama). The two of them had five children, listed below. Eulla died in August 1969 in Escambia County, Florida, and Harry died on 20 February 1977 in Pensacola, Florida. They are buried together in Bayview Memorial Park Cemetery in Escambia County, Florida. Eulla Mildred Botts was born on 13 March 1907 and married in 1938 to John Paul Bracewell (born in 1906 in Florida). They had two children, Paula and Byron, listed below. John died on 16 January 1945 in Lee County, Florida, and is buried in Fort Myers Cemetery in Lee County, Florida. Eulla died in October 1987. Paula Francene Bracewell was born on 4 September 1941. She married (1st) a Mr. Dunn. She married (2nd) Elliott Howland Shovar in June 1964 in Escambia County, Florida, and they divorced in September 1966 in Alachua County, Florida. She married (3rd) Norman Wade Parish (1939-1983) on 9 July 1972 in Escambia County, Florida, and they divorced there on 18 February 1975. She married (4th) Dewey Leon Smith on 5 May 1987 in Escambia County, Florida. Byron Arthur Bracewell was born on 19 July 1943. Frances Aurilia Botts was born on 31 October 1908. She married Sylvester George Thurman in 1950 in Escambia County, Florida. Frances was a tax assessor of Escambia County, Florida, until January 1958. She then worked as a real estate broker specializing in appraisals. 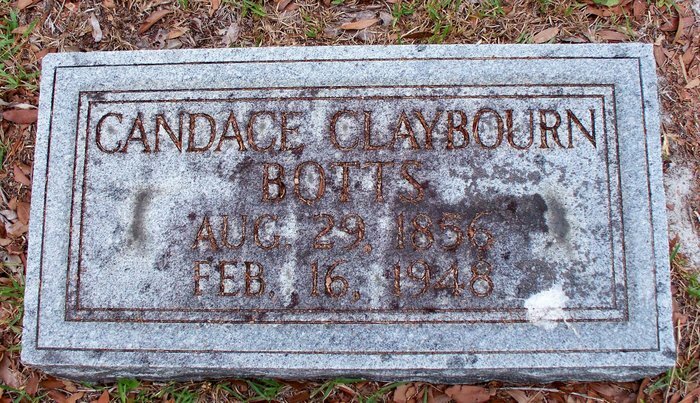 Frances died on 30 June 1994 in Escambia County and is buried there in Bayview Memorial Park Cemetery with the name Francesa Botts. Dorothy Irene Botts (“Irene”) was born on 7 November 1910, and married Albert Laney in about 1940. They had one child, Michael Laney, born on 20 September 1950. Albert was a well known sports writer from New York City who also wrote for the Paris Herald Tribune, covering mostly tennis and golf, but also some baseball. He wrote a book called “Covering the Court” about his years reporting on tennis. Irene was a professional pianist and taught at the Spring Valley Waldorf school in New York State. Irene died on 13 November 1974. 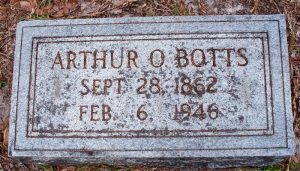 Harry Arthur Botts, Jr. was born on 18 January 1913. He served in World War II in the Army in Alaska and the Aleutians, and later as a Lt. Col. in the Florida National Guard. He married on 9 April 1938 to Helen Barry (born on 1 February 1915 in Brush Creek, Smith County, Tennessee) They lived in Pensacola, Florida. They had two children, Stephen and Judith, listed below. Harry served in the Florida House of Representatives representing Escambia County as a Democrat from 1947 until the 1949 term. Helen died on 27 January 1996 in Pinellas County, Florida. Harry died on 17 January 2008 in Escambia County, Florida. They are buried together in Chapel Hill Memorial Park Cemetery in Pinellas County. Stephen Claibourne Botts was born on 7 May 1941 in Galveston County, Texas. He married (1st) Sandra Ann Young in July 1965 in Palm Beach County, Florida, and they divorced on 7 June 1982 in Jefferson County, Florida. He married (2nd) Cheryl Lee Andrews on 18 August 1984 in Leon County, Florida. Judith Lynn Botts was born on 20 May 1954 in Largo, Pinellas County, Florida, and died there on 14 April 2007. She is buried in Chapel Hill Memorial Park Cemetery in Pinellas County. Margaret Etta Botts was born on 23 November 1918. She married William Edward Balmer (“Ed”) of Whitinsville, Massachusetts on 28 June 1941 under a rose trellis in Ed’s family’s back yard. They first met a few years earlier on a blind date in Hoboken at the “The Blue Flame!” (the date had been arranged by Margaret’s sister Irene). Ed was a student at Stevens Tech in Hoboken at the time and later worked as a custom wooden station wagon body builder, then a swimming pool builder; he always dreamed of building a carousel. Margaret had a beautiful alto voice and sung in a madrigal group, along with raising her five kids. In 1958 the family moved from Big Indian to Shady, New York, which is part of Woodstock, near Kingston, New York. They were famous for the cider pressing parties they held each fall in their back yard in Shady. Ed played bass balalaika while Margaret was an accordionist and classically trained pianist, hosting weekly get-togethers of musicians, who would play pop songs. Margaret died at home on 20 March 1994 surrounded by her family. Her husband Ed died just over four years later on 19 October 1998. William Edward Balmer (“Bill”) was born on 7 August 1945 in Clovis, Curry County, New Mexico. He died on 28 November 1995. Bill’s widow, Linda Seaman Balmer, lived with their daughter Kelly in South Carolina. Barton H. Balmer (“Bart”) was born on 27 May 1947 and lived in Woodstock, New York. Bruce Balmer was born on 7 November 1950. He began playing the piano at a young age, five years old, when the family lived in Big Indian, New York. In about 1958 the family moved to Shady, a hamlet in the town of Woodstock, New York, when there were still a few working farms left, and continued his growth as a musician. At about age 15, his older brother Bart introduced him to the classic guitar and he played it virtually every day of his life thereafter. From 1968 to 1972 he was a student of chorus, piano, harmony and analysis under tutelage of Blanche Moyse at Marlboro College, where he received a bachelor of arts. He played in many bands as lead guitarist, including rock groups, vocal groups, jazz groups, and, while living in Fort Collins, Colorado in the early 1980s, a number of country and western bands. In the early 1980s he also began writing songs. Bruce married Susan Ann Moseman and they had two children, Freyja and Noah, listed below. They divorced and Bruce married (2nd) Kathleen and they also divorced. He married (3rd) to Lisa Markley in May of 2008 at the Kerrville Folk Festival in Texas. Both Bruce and Lisa worked as musicians and were based in Dallas, Texas. Their website can be found here. Freyja Balmer was born on 3 October 1973 and graduated with a bachelor of arts degree from Hampshire College, having studied urban and cultural studies and literary criticism. She married John Terrence Gallagher on 30 September 2007. [John Gallagher was born on 17 February 1971.] They later divorced. Together they had two sons, Arran Hathaway Gallagher, born on 6 August 2008, and Cormac Finn Orion Gallagher, born on 16 June 2012. Freyja worked in a number of digital media and technology roles and was the product director for Food.com at Scripps Networks Interactive. Noah Otis Balmer was born on 21 October 1976. He attended Onteora High School (class of 1994) and State University of New York at Potsdam. He worked as a Senior Manager of Engineering for Kiva, an organization working to fight poverty through small loans. Brian Craig MacGillivray Balmer (“Craig”) was born on 22 July 1955 and lived in Woodstock, New York. Candace Balmer was born on 27 November 1958. She was a water quality expert and worked with a rural assistance program for small communities to find water system upgrade funding (RCAP). She was a lover of bonfires, music, cats and her garden, and also lived in Woodstock. Frederick William Botts was born on 20 December 1885 at Eldridge in Volusia County, Florida. He grew up on his father’s orange plantation, finished his grammar school education in Volusia County, and then entered the John B. Stetson University at DeLand, Florida. He graduated with a bachelor of science in 1908, and received his law degree from the College of Law in 1909. He remained at DeLand for two years as an instructor in the Law School, and then for two years he practiced at Jacksonville, Florida. Following this came an appointment for seven years as assistant United States District Attorney for the Southern District in Florida. On 22 April 1915 he married Edwina Walker Rowe and they had two children, listed below. [Edwina Rowe was born on in 1886 in Hartford, Kentucky to Jacob Edwin Rowe (1857-1931) and Mahala Logan Walker (1858 – 1943). Jacob E. Rowe was a well known and respected attorney in Kentucky. His biography is set forth in detail in a book titled History of Kentucky, In Five Volumes by William Elsey Connelley and F.M. Coulter, Ph. D.] On 1 July 1920 they moved to Miami and Frederick established himself as an attorney in that city, handling a general practice in the various State and Federal courts. Although one of the younger members of the bar, he was regarded as one of the leaders in his profession at Miami. Edwina worked as a director of the Y.W.C.A. and the Miami chapter of the Daughters of the American Revolution. She was also a member of the United Daughters of the Confederacy. The couple attended First Presbyterian Church, with Frederick serving as an elder. However, after an illness lasting six weeks, Edwina died young on 28 August 1938. He married (2nd) in 1940 in Dade County, Florida, to Maxine P. Salmon (1911-1973), previously married to William Horne, and they divorced in 1947 in Monroe County, Florida. In 1942, with World War II raging, Frederick was once again called to serve as an Assistant U.S. District Attorney to fill the vacancy of Hayford Enwall, former colonel, who was granted leave of absence to serve in the military. Frederick served in this capacity until June of 1946. He was a contributor to “The Rhodes Family in America” book in the 1950s, which was the largest published Botts family compendium. [Per correspondence with David Botts of San Antonio, Texas. This book was published by Greenwich Book Publishers in 1959.] He died on 2 March 1972 and is buried with his first wife Edwina in Woodlawn Park North Cemetery in Dade County, Florida. Frederick William Botts, Jr. was born on 20 June 1922. He graduated from the U.S. Naval Academy in Annapolis in 1945. On 27 July 1945, he married Miriam Croley. [Miriam Croley was born on 18 July 1926 to Edythe Miriam Croley (1900-1990) and Joseph Lantham Croley (1894-1962).] She attended the University of Texas and was a member of Kappa Kappa Gamma. Together Frederick and Miriam had two children, listed below. They raised the family from 1958 to 1967 in Buenos Aires. Miriam was active in the Junior League, Junior Mentor Club, worked with Camp Fire Girls, Junior Marianne Scruggs Garden Club, and served in the P.T.A. They divorced on 5 October 1976 and Miriam later remarried to Kimball S. Watson on 20 August 1977 and died on 29 October 2001. Frederick achieved the rank of Lt. Commander when he resigned from the armed forces in 1956. Following his service in the military he worked for Chance Vought Aircraft in Dallas from 1956 to 1959, and then in Washington, D.C. in the spring of 1959. He married Claire Susan Golde (known as “Susan”) on 10 September 1983. Frederick died on 29 November 2011 in Austin, Texas. Kimberly Ann Botts was born on 18 May 1952 in Pensacola, Florida. She married Alvin Morris Smith Jr. on 14 October 1978 in Okaloosa County, Florida. Frederick William Botts III (“Rick”) was born on 28 January 1953 in Dallas, Texas. At the age of five, when the family moved to Buenos Aires, Rick became fluent in Spanish through his playmates. He attended St. Andres and American Community (Lincoln) schools. When he was fourteen, the family returned, and he attended Highland Park Junior High and graduated from The Westminster Schools, Atlanta. After two years of religious studies at the University of Virginia, he moved to Vermont to turn bowls and trim apple trees throughout the winter with Bill Logan, then on to Los Angeles and Santa Fe to work with family. After working as a cabinetmaker for Shelter Associates in Charlottesville where he met his future wife Barbara Bass, he answered the call of music and earned a degree in Studio Guitar from the University of Southern California. Rick and Barbara married on 15 June 1985 in Dallas County, Texas. He taught all guitar styles in Santa Monica and in about 1993 the family settled in Austin, Texas, where Rick worked at the University of Texas in user services for 13 years. He was employed at Concordia University Texas as Director of Customer Support. Rick and Barbara attended the Sanctuary Church where Rick also operated the sound board and played electric bass, and was a member of the Friday Night Poker Boys. Rick was remembered for his talents to build and repair anything and everything, his love of cooking without a recipe, his talent for friendship, and his gift to make people laugh. His family was the focus of his life, and his love and support of others was always evident in his relationships. Rick died on 15 May 2013 in his Austin, Texas home surrounded by his family. Katherine Anne Botts was born in 1989. Christopher Logan Botts was born on 26 April 1984 in Los Angeles, California to Rick and Claire Botts. Casey William Botts was born on 25 November 1985 in Los Angeles County, California, to Rick and Claire Botts. Laurance Hooten Botts was born on 24 January 1887. He lived in Deland, Florida, and married on 16 February 1916 to Emma Grey Bracey (born on 26 January 1888 in Mecklenburg County, Virginia). In his World War I draft registration he claimed an exemption as a farmer with a dependent wife. 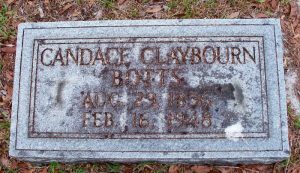 On 25 November 1921 the couple had a son, Laurance Hooten Botts, but the child died that same day and the labor took Emma’s life two days later on 27 November 1921. Emma is buried in Mecklenburg County in the Bracey Family Cemetery. About three years later on 22 November 1924 Laurance married Dorothy Randolph Bracey, a relative of his first wife. Together they had three children, listed below. Laurance died on 14 February 1946. Dorothy followed years later on 5 June 1979. Laurance Hooten Botts was born and died on 25 November 1921. Laurance Bracey Botts (“Larry”) was born on 30 April 1928. He served twenty-four years in the U.S. Marine Corps, including stints during the Korean and Vietnam Wars. He later worked as a Chief Warrant Officer with the Marines. Following his service, he worked for Diamond Shamrock Chemical Company. He was a member of Myrtle Grove Baptist Church where he served in many capacities including deacon, Sunday School teacher, choir member, and often taught special Bible Study classes. Larry found his calling when he became a coordinator for the North Carolina Baptist Lay Witness Foundation. Larry was also a member of the Marine Corp Engineering Association. He was an avid hunter and fisherman, which he learned as a young boy growing up on the banks of the St. John’s River in Deland, Florida. He also enjoyed woodworking, working in his vegetable garden and never missed an opportunity to tell a story. He married (1st) on 24 December 1949 to Nita Marie McCarthy, formerly married to Eugene F. Utech (1926-2008). Larry and Nita later divorced, but did have children, listed below. Larry’s obituary indicates he had a daughter named Terry Bulla in addition to those listed below, so she was either a product of this first marriage or Larry had adopted her. She was born on 30 April 1948, prior to Larry and Nita’s marriage, and she went by the name Teresa “Terry” Botts. She attended High Point College in North Carolina and married Kenneth Allen Bulla (born 1945 in Guilford County, North Carolina). Larry married (2nd) Billie Evelina Raper on 26 November 1961. Larry died on 20 October 2011 and is buried in the Veterans Field of Honor at Greenlawn Memorial Park. Nancy Marie Botts was born on 10 December 1950. She married in January 1967 in Volusia County, Florida, to Robert Lee Stein and they divorced there on 2 June 1986. Pamala Faye Botta was born on 29 December 1951. She married on 11 February 1972 in Volusia County, Florida, to Robert Paul Decker. Michael Laurance Botts was born on 18 November 1955 in Onslow County, North Carolina. He married on 22 February 1986 in Hillsborough County, Florida, to Veronica Joan Duffy. Nita Candace Botts was born on 27 February 1931 and married Raymon Charles Pitts on 1 March 1952. They lived in Jacksonville, Florida and had two children, listed below. Raymond Charles Pitts Jr. was born on 10 July 1957. He married on 6 July 1990 in Alachua County, Florida, to Christine Elizabeth Hughes. Randel Drew Pitts was born on 24 July 1959. He married on 30 April 1983 in Hillsborough County, Florida, to Debra Jean Kelley. Dorothy Jane Botts (“Jane”) was born 22 April 1934 and married Mackey L. Jones on 2 May 1954. They lived in Daytona Beach, Florida and had three children, listed below. The two divorced on 17 May 1993 in Volusia County, Florida. Jane later married Charles Albert Ogletree Jr. (1934-2011). Kelley Drew Jones (a girl) was born on 19 November 1957. There is a record for Kelly Dru Jones marrying Edward Albert Roberson on 29 November 1980 in Volusia County, Florida. There is also a record for Kelly D. Jones, born on 19 November 1957, living in Port Orange, Florida, in 1993. Kirk Brian Jones was born on 1 December 1960. He died on 12 June 1990 in Volusia County, Florida, and is buried there in Daytona Park Memorial Cemetery. Todd Alan Jones was born on 3 November 1961. He married on 11 May 1985 in Volusia County, Florida, to Vicky Leigh Rich. Clifford Isadore Botts was born 4 October 1888 and lived in Deland, Florida. On 30 October 1916 he married in Volusia County, Florida, to Lillian Izetta Tweedy (born on 2 August 1893 in Mills County, Iowa). They had two children, listed below. On his World War I draft registration he listed his occupation as Deputy Clerk of the Court in DeLand, Florida. Clifford died on 26 February 1975 and Lillian on 9 December 1983. Truman Arthur Botts was born 26 November 1917. He received his bachelor of science degree in mathematics and physics from then-tiny Stetson University in Florida in 1938, followed by two degrees from the University of Virginia, a masters in 1940 and a Ph.D. in 1942 (under E. J. McShane). He served in World War II from 1942-1946 and later as a Commander in the Naval Reserve. Truman married Barbara Jeanne Bishop on 26 October 1944, and they later divorced. Truman joined the faculty at the University of Delaware in 1946 but remained only two years before returning to Virginia. He was best known for publishing his book Real Analysis, written with his dissertation supervisor E. J. McShane and first published in 1959. The book was popular with undergraduate and graduate level courses as a survey of practical elements of real function theory, general topology, and functional analysis. He left the University of Virginia in 1968 to become Executive Director of the Conference Board of the Mathematical Sciences. Truman married (2nd) on 15 January 1974 in Arlington County, Virginia, to Gisela Conti (born on 7 February 1928 in Zurich, Switzerland), previously married to John A. Nugent. Gisela died on 21 June 2010 in Arlington County. Truman died on 4 February 2005 in Arlington, Virginia. Dorothy Jean Botts (“Jean”) was born 13 November 1920. She served in the WAVES (Women Accepted for Volunteer Emergency Service) from 1943-1947 and received her Ph.D. from the University of Chicago in 1950. She would later marry Dr. Manuel F. Morales on 19 June 1958 and the two of them lived in San Francisco, California. Jean died on 18 June 2000 in San Francisco County, California. Mourton Edward Botts was born 4 January 1891 and died nearly a year later on 8 January 1892. He is buried with his father’s parents in Purdom Cemetery in Volusia County, Florida. Stella May Botts was born 21 September 1893 and lived in Jacksonville, Florida, near Deland. She married Chesley Alton Guess on 25 September 1918. [Chesley Guess was born on 5 May 1897 and died on 8 March 1956.] The two separated and then divorced in 1939. They had no children. Stella died on 1 June 1983 in Volusia County, Florida, and is buried there in Oakdale Cemetery. Eulla Grace Botts was born 25 January 1895 in Osteen, Florida. She married George Wilson Coleman on 2 April 1919, and lived in West Palm Beach, Florida. George worked as a lawyer at the firm of Coleman and Cook. They had no children. George died in 1978 and Eulla died on 20 June 1984 in Palm Beach, Florida.